Hey guys! 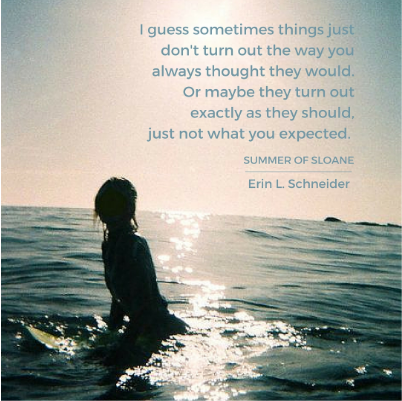 Today, I’ll be posting an interview with Erin Schneider, the author of Summer of Sloane for the May SST tour. if y’all don’t know what the sst tour is, go check out the lovely founder of this street team, nori, over here! So I’ve done some (stalking) poking around, and I found that you’ve attended college in Honolulu! 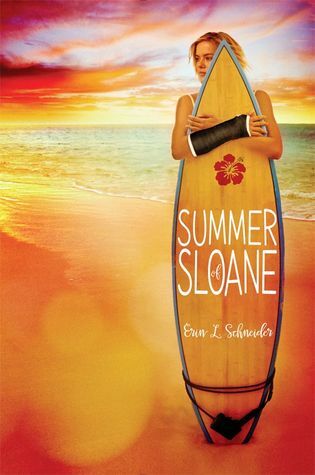 That’s so cool, since Summer of Sloane is set in Honolulu as well! How did your experiences there shape the setting of your story? ELS: My mom’s side of the family is Native Hawaiian and I’ve been traveling back and forth to the Islands my entire life — so when it came time to pick a college, well, what better place than Hawai’i right? And somehow I always knew I’d write and set a book there, so when I started SLOANE, Honolulu just felt like the right home for it. Besides, writing about a place I’m so familiar with is definitely much easier than guessing at a place I’ve never been! Do you remember the first story you’ve ever written? What was it about? ELS: I wrote a lengthy story about Giraffe and his bed friend, Monkey. I remember being so enthralled in this story that I tried to convince my mom to let me get a pet giraffe — who could live in our fireplace / chimney. And if that wasn’t going to work, then at the very least, she should let me have a monkey. To this day, while I know a giraffe probably wouldn’t make the best pet, I’d still like a monkey. Who were the authors that you always found yourself looking up to? ELS: Definitely Roald Dahl — to this day, he’s still one of my all time favorite authors! And of course, J.K. Rowling…I’m not quite sure another author of her caliber will ever come along, at least in my lifetime. What would you do if you had hit writer’s block when writing Summer of Sloane? ELS: I don’t know what it is, but I always have my worst bout of writer’s block every Fall. It never fails, I swear. Come September – October, I will sit and stare at my laptop for HOURS. So finally after the fourth year of having the same problem, I realized I just needed to stop writing during that time and instead, I focus on the months that I usually have my best writing moments — which is spring, usually from April – June. Not sure if it’s because of the end of the school year and the weather changing, but that’s when I do my best writing. Summarize your entire book in a single photo. Name a book that had the biggest impact on you in the last year? ELS: Hands down, THE LOOSE ENDS LIST by Carrie Firestone. It’s been a long time since I sobbed uncontrollably while reading a book, but this one had me completely undone. It deals with cancer and losing people that mean the world to you, which is something I can personally relate to. What sparked the idea of you becoming an author? ELS: I’ve always wanted to write for as long as I can remember…ever since I read my first Roald Dahl book. To this day, it’s because of him, the far away make-believe worlds I created were ever put into words on paper. Erin L. Schneider is native to the Pacific Northwest, attended college in Honolulu – and although Hawaiian – should never be allowed on a surfboard. With more than twenty years in corporate merchandising, she’s now a full-time writer living in Seattle with her husband, Neal; their baby boy, Kellan; a rowdy German shepherd named Ronin; and two crazy cats, Ono and Poke. She’s a member of both the Pacific Northwest Writers Association and SCBWI, and is also co-founder of the YA Buccaneers. SUMMER OF SLOANE is her debut novel, out May 3, 2016 from Disney-Hyperion. Visit Erin online at Erin L Schneider or on Twitter: @ErinLSchneider1. Erin is represented by literary agent Lisa Grubka of Fletcher & Company. Summer of Sloane looks like the PERFECT read. Surfing + Hawaii = yes please! There’s also a wicked giveaway for y’all to enter!